Our kids have finally reached the age when we can all pack the minimum of things, head towards the mountains and have a hell of a good time. Yay! Since it’s still warm (but not hot) and backpacks much lighter than in the colder months ahead, September is probably the best time to take a weekend trip to the mountains. And so we did. 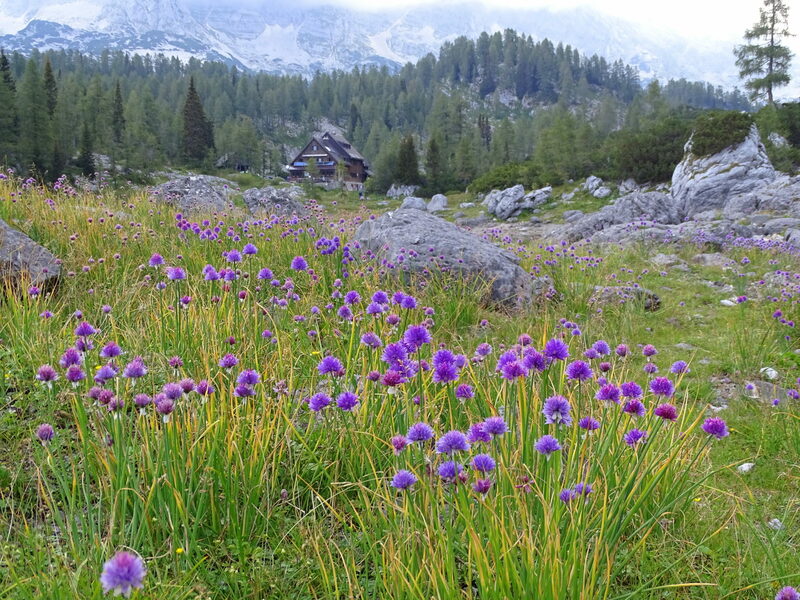 We parked our car below the alpine pasture Planina Blato (1,147 m – 3,763 ft) and started hiking towards the Triglav Lakes Valley, one of the most beautiful valleys in the Julian Alps famous for its seven lakes. The trail is easy and popular with individual hikers, large groups and families. Not too crowded either. 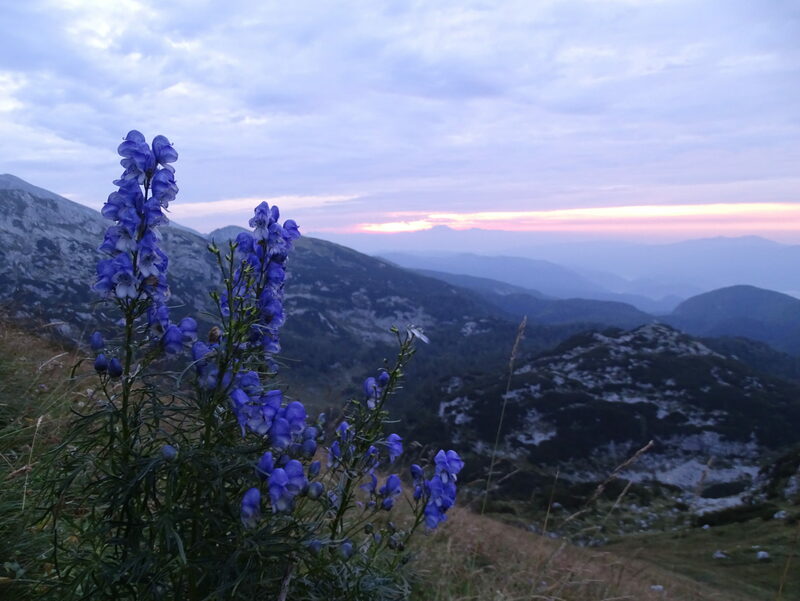 Much like Šmarna gora at 6.30 am; you hike alone but keep meeting other similar minded hikers throughout the way. But obviously crowded enough for tourists to adopt and perfect their pronunciation of “Dober dan”, blending right in the usual mountain bunch. 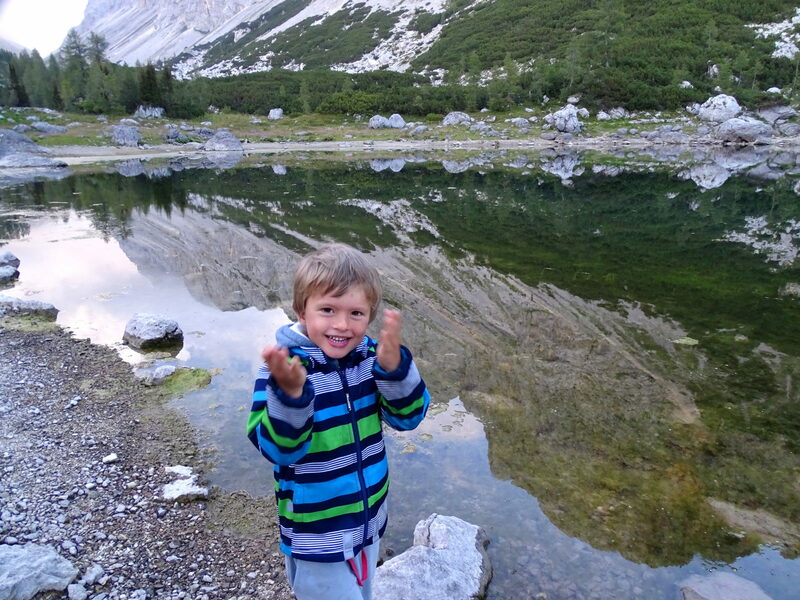 With the trail passing a lake and many alpine pastures with little wooden cottages and friendly cattle lazily munching on soft grass, this just might be one of the most family-friendly mountain trails in Slovenia. And the best part is – the path takes you to somewhere totally spectacular; that is in only three hours (more like 5 or 6 if you’re hiking with children). 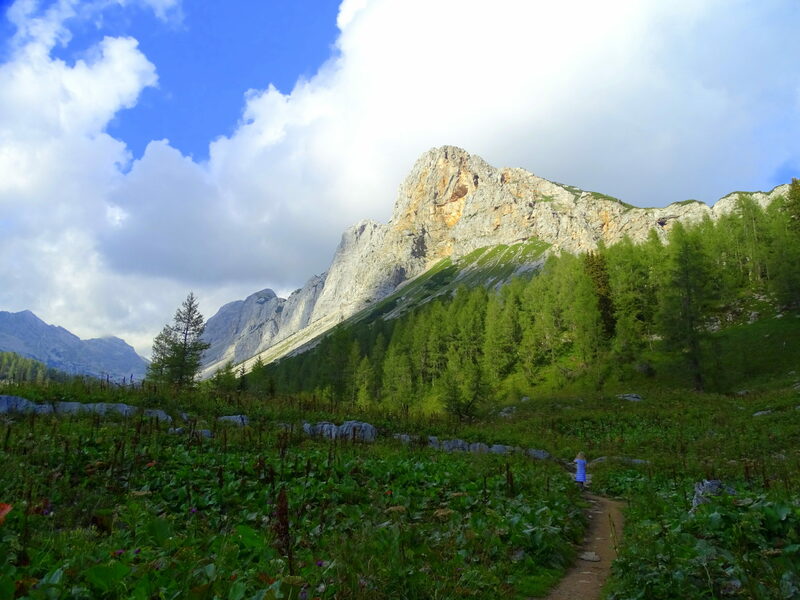 Entering the Triglav Lakes Valley felt like walking into a fairytale. Lush pink flowers grow everywhere. 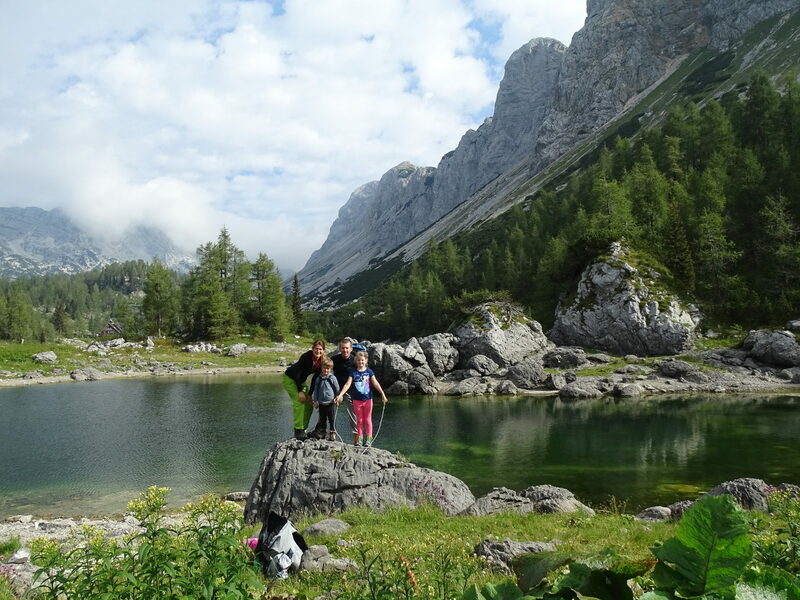 Anyway, we arrived at the Triglav Lakes Cottage at 5 pm, hung around the Double Lake (1,685 m - 5,528 ft) for another hour, ate the dinner in the cottage and then returned to the lakes for sunset. Sunlit mountains towering above green lakes, meadows of pink flowers and big boulders radiated something magical and resembled a place one could easily find in a fairytale and not just a few hours off the main road. The cottage was completely full and I thanked my lucky stars that I did remember to call a week before and reserve a room. Otherwise, we would have had no other choice but to join the others less fortunate squeezing on the wood benches inside and outside the cottage. Instead, we curled up in comfy beds listening to exhilarating tunes of an accordion and a guitar, which in a strange world out there actually made a nice melody together, and eventually fell asleep. The next morning, I had my alarm set for 5.00. Since we were looking at an uncertain weather forecast with possible thunderstorms in the afternoon, an early start was the only way to immerse myself in an extra adventure before finally setting off back home after breakfast. Besides, after a blissful day of hiking with complaining kids, walking uphill alone in the early dawn of the day truly felt like the only right thing to do. A revitalizing treatment of a sort. But more than anything, I would be exploring something completely new. My goal was Mt. Mala Tičarica (2,071 m – 6,795 ft), a scenic peak overlooking the Double Lake, the Triglav Lakes Valley and the other side of the mountains. Don't you just love those first sunrays peeking over the horizon announcing a new day? It’s an hour hike from the lodge; not much, but there is, as always, a catch. Considering my plan, which was to catch the sunrise at the top of Mt. Mala Tičarica bound at 6.25, waking up at 5 would have left me with just enough time to dress up, eat a snack and haul myself up at a normal morning pace. Instead, the subconscious sleepy me woke up sometime during the night and reset the alarm in that 10-second hazy half-in-the-coma wake-up to the seemingly more humane time of 5.45, leaving me with just 30 minutes for the hike. Aargh the rush! Needless to say, I started at a laudable pace hopping through the first section like a cheetah, only to hit the low energy wall soon after climbing over to the other side of the mountain. It slowed me down enormously but I kept fighting until I reached a spot just below the peak, which thankfully opened up perfectly to the sunrise-lit mountains. It was incredible. I just sat on a rock and watched the explosion of morning colors dance in the sky. There was nobody but me and my sleepy thoughts. 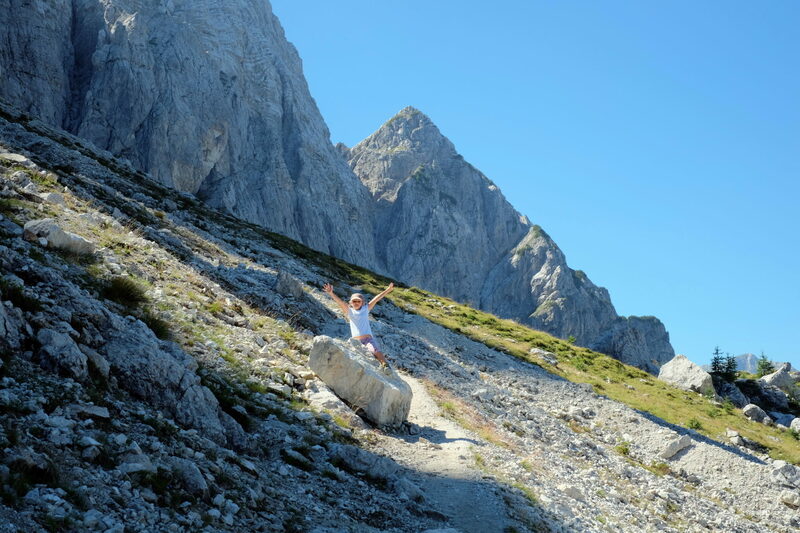 Everyone else who started early had taken another trail marked for Triglav. I, however, was enjoying the nature’s finest show in the front row completely alone. 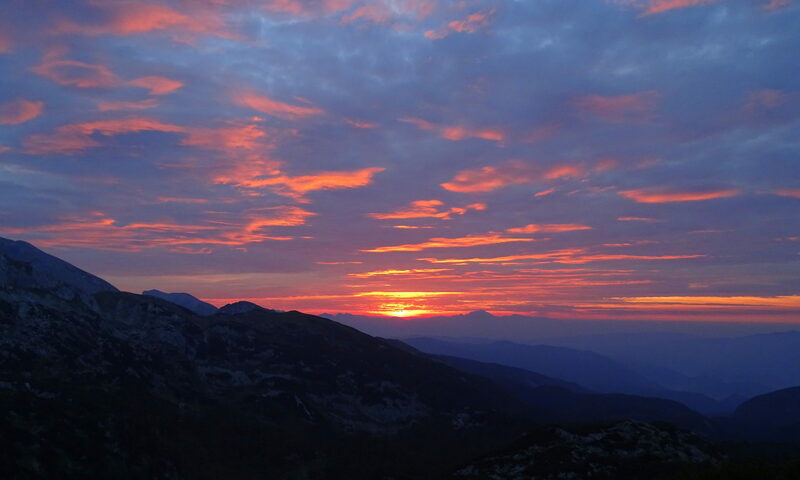 Eventually, after the sun hid behind the clouds taking with it the vibrant shades of red, pink and orange, I finished what I started and climbed to the actual peak of Mala Tičarica, where I finally treated myself to a much deserved sandwich (because one must always have a snack at the top, am I right?!). The odd gray world that starts after this point. So many peaks to explore! A tip: click to enlarge it. An appealing idea of extending my adventure to other peaks in that mountain range crossed my mind several times, but the more I calculated, the less feasible it really was. Surely I could tell my family to start moving on without me, but hey, since we did arrive there as a family, leaving as one was indeed the only right thing to do. I found them in the cottage, hungry, waiting for me to order breakfast together, and I thanked my lucky stars again for making the right decision up there. The greatest benefit of walking a certain milage in the morning, though, is that the whole world seems nicer afterwards. We were served the best eggs, the shoes apparently dried up quicker in the mountains after the younger of the rascals accidentally stepped in the lake. Heck, even hiking back turned out a rewarding experience and, above all, more relaxing than coming there. The kids completely sank in their private little games and played through almost the whole of our return. Everything just seemed to fit in its place. With a few relatively warm and sunny weekends ahead, I encourage you to go out. Get creative. If you have small kids, take them with you. Explore the unknown together, even if it pushes a touch away from your comfort zone. Maybe you'll find pristine back country, alpine lakes and towering mountains. Maybe you'll be chased off the mountain by a thunder. It doesn't matter really as long as you all enjoy the adventure. Until next time! Stay tuned for more outdoor adventures! Follow us on Facebook, Twitter, Instagram, Youtube and subscribe to the feed. Wow, what a fantastic hike and lovely photo collection to match. 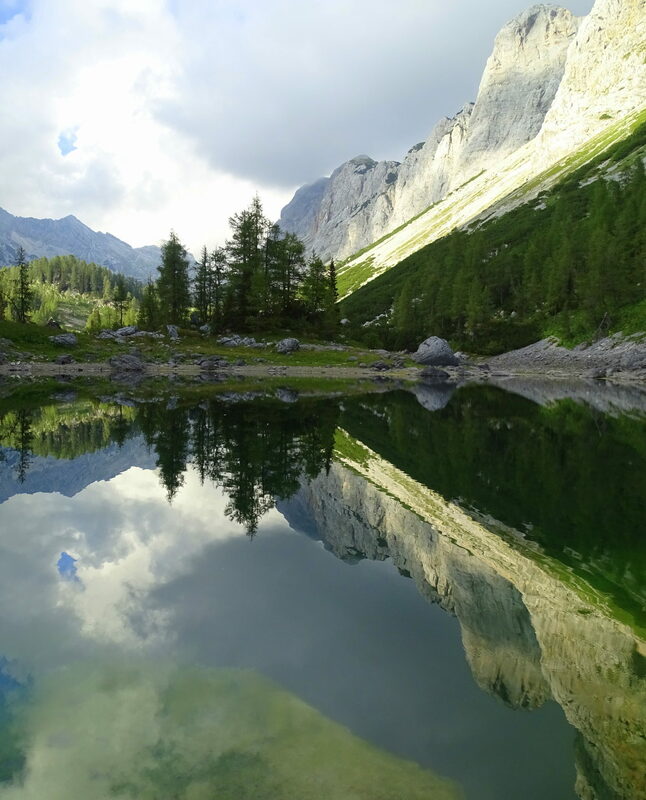 Triglav Lakes is such an amazing area. Amazing trip, we would love too do this or a similar hike with our family this summer (2017 august), do you have a detailed description of the trip or is it in any guide book we can buy? Sorry for my late reply Liesbet. We basically followed this route: http://www.hribi.net/izlet/planina_blato_koca_pri_triglavskih_jezerih_cez_prode/1/133/110 Maybe you could translate it online. You start at Planina Blato (above Lake Bohinj) and follow the signs for Planina pri Jezeru, then towards Planina Dedno Polje, then Planina Ovčarija, and finally Koča Pri Triglavskih Jezrih. There are two routes that seperate right before Planina Ovčarija: Preko Prodov or Preko Štapc. We took the easier Preko Prodov. 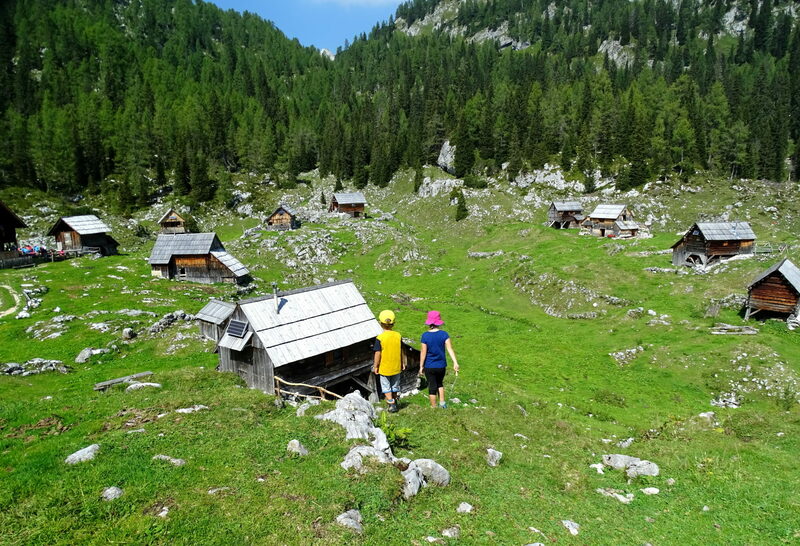 If your children are a bit bigger and they won’t mind some extra elevation gain and a few steel cables in steeper spots, then take the route Preko Štapc. Otherwise, take the easier Preko Prodov and rather make a solo extra trip to Mala Tičarica yourself while your kids wait by the lakes and the hut. From the lakes (Double Lake), you can extend your trip to Zasavska Koča na Prehodavcih the next day: http://www.hribi.net/izlet/planina_blato_zasavska_koca_na_prehodavcih_cez_prode/1/175/285 (the first part of the route is the same as the one for the Triglav Lakes). 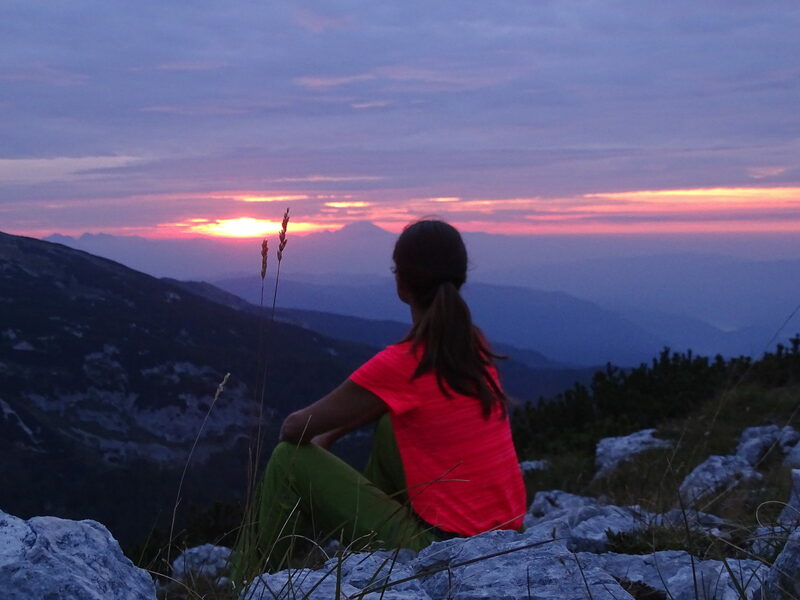 Btw I’d really love to get your feedback after the hike, so you are welcome to drop me an email to info@exploringslovenia. 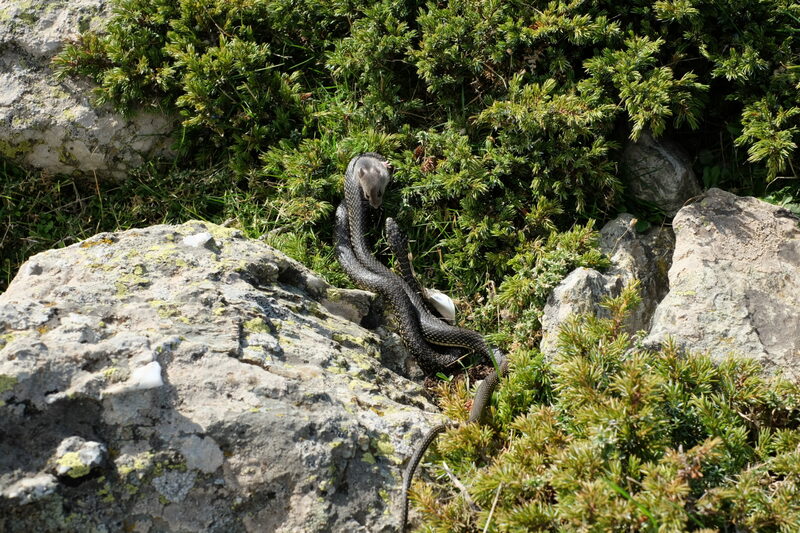 If you think you might need some help with the hike, let me know and I’ll talk to a friend mountain guide.